Earlier this year, Ubisoft released its action-fighting game For Honor and the studio is planning to offer multiplayer title for free this weekend across all the platforms. According to Ubisoft, the free weekend will kick off from Thursday, August 10th will be ending on Sunday, August 13th for the PC, PS4 and Xbox One. The studio also provided start and end timings of the free weekend trial of different regions such as America, Europe, Middle East, Asia and Oceania. 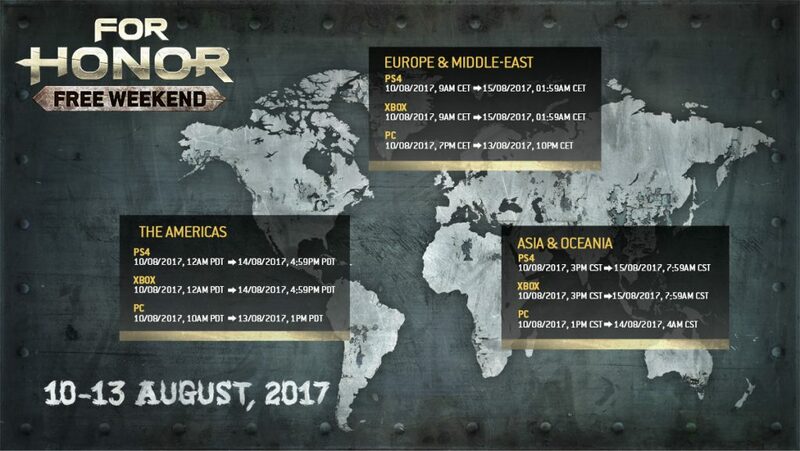 For Honor free weekend participants can pre load the title from today, August 8th for PC and PS4. In addition to the free weekend, Ubisoft will also offer the title at 50% discount on its standard and gold edition. The offer will end on August 20th and those purchase the title will be carrying their game progress to the original game. As per the studio, the participants will be offered full game content such as single player campaign, co-operative mode, five multiplayer modes with access to all the available heroes. Console players will need PS Plus subscription and Xbox Live membership in order to access the multiplayer mode of the game. Ubisoft is also planning to release the third season for the entitled as “Grudge & Glory”, also known as the biggest season till now on August 15th. The new season will add new heroes (Highlander and Gladiator), maps, game modes and a couple of updates. For Honor is a PvP fighting game available for PC, PS4 and Xbox One. Recently, it was confirmed that studio is working on dedicated servers for the game and the work will be completed within some months. Stay tuned for more updates!